It's a fact of life when it comes to working with digital photos and images. Sometimes, we need to compress them to make our file sizes smaller, especially if we're emailing them to a client or to family members, or posting them on a website. Since the jpeg file format is still the format of choice for digital photos, even though it's been around for more than 15 years, compressing images usually means using jpeg compression, which does a great job of reducing the file size. Unfortunately, it also reduces image quality, although it's not always easy to see what sort of negative impact the compression is having on the image, especially when viewing it on a computer monitor. But thanks to Photoshop and one of its rarely-used blending modes, the horrors of jpeg compression become strikingly clear. To see exactly what's happening to our images, we'll use Photoshop's Difference layer blend mode. The Difference blend mode gets its name from the fact that it looks for differences between two layers. Any areas in both layers that are exactly the same appear as pure black, while areas that are different in some way appear as strange colors. The Difference blend mode isn't used very often outside of the special effects world, but it does a great job of showing us how much garbage (yes, I said garbage) we're adding to our jpeg images when we compress them. Now, this isn't to say that we all need to stop compressing our photos. In a perfect world, sure, but that's just not realistic. It does help, though, for us to see and understand what's happening to our images, especially for those of us who, up until now, have been convinced there's no difference in image quality between a compressed and uncompressed digital photo. Two document windows open in Photoshop, each displaying a copy of the same photo. But are they really the same image? Appearances can be deceiving, especially on a computer screen. The truth is, they're not the same. The one on the right is the original, uncompressed photo, as if it was downloaded directly from a digital camera. The one on the left is a copy of the photo saved in Photoshop at 60% image quality, which is a fairly typical setting. This means that the image on the left has been compressed. I realize it's a little difficult to tell in the screenshot above, but if you were to look at both of these images on my screen in Photoshop, you'd have trouble telling which one is compressed and which one isn't. If we were to print them, the differences would become clear, but on a computer screen, which has a much lower resolution than a printed image would have, the differences are not so easy to spot. At least, not without using Photoshop's Difference blend mode to help us out. The Layers palette for the original, uncompressed photo showing the Background layer and the copy of the Background layer above it. Changing the blend mode of "Layer 1" to "Difference". 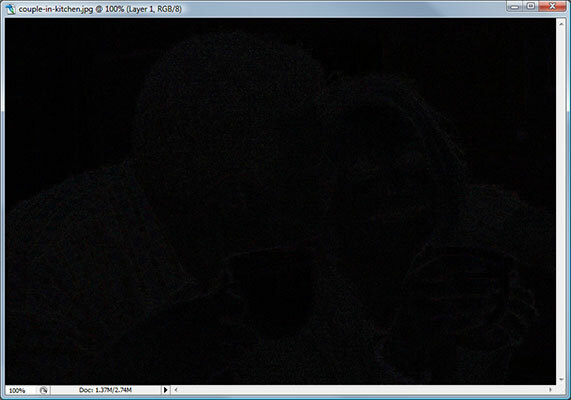 The image is now completely filled with solid black, indicating that both "Layer 1" and the Background layer are identical in every way. Clicking the "New Adjustment Layer" icon at the bottom of the Layers palette in Photoshop. The Histogram in the center of the Levels dialog box is displaying a single vertical bar on the far left, telling me that every pixel in my image is pure black. The Histogram confirms that there are currently no other colors being displayed in my image except pure black, which means that "Layer 1" and the Background layer are 100% identical. So far, so good. We've now proven what most of us already knew, that when we make a copy of a layer, the copy is identical in every way to the original. Exciting stuff, right? Let's move on. Dragging "Layer 1" down on to the trash bin icon at the bottom of the Layers palette to delete it. The Layers palette showing the original Background layer. Using the Move Tool and dragging the compressed version of the image on the left into the uncompressed version's document window on the right. Both images are now aligned perfectly one above the other in the same document window. The Layers palette showing the uncompressed version on the Background layer and the compressed version on "Layer 1". The document window after changing the blend mode of "Layer 1" (the compressed version of the photo) to "Difference". Hmm. Can you see all that faint noise in the image above? It will depend on how you have your monitor set up. You may just be seeing black, but I can see on my screen that it's definitely not pure black like it was before when we were comparing the Background layer with an identical copy of it. There's something else there, and that "something else" is telling us that the compressed and uncompressed versions of the photo are not the same. But just how different are they? Does jpeg compression really make that much of a difference? Selecting a "Levels" adjustment layer in the Layers palette. The Histogram is no longer just a single vertical bar. There seems to be a lot more going on this time on the far left of the Histogram, which confirms that my eyes weren't playing tricks on me. There's definitely something else there in the image. The single vertical bar has been replaced by a larger area of black, which means the image itself now contains more than just pure black, and that means there's areas in the two versions of the photo that are no longer identical. Dragging the white slider from the bottom right of the Histogram over to the left to the point where the black slope begins. The noise is now much more visible in the image. Not a pretty sight, is it? Now that we can see things more easily, all of those weird colors represent all the damage we've done to the image by compressing it. 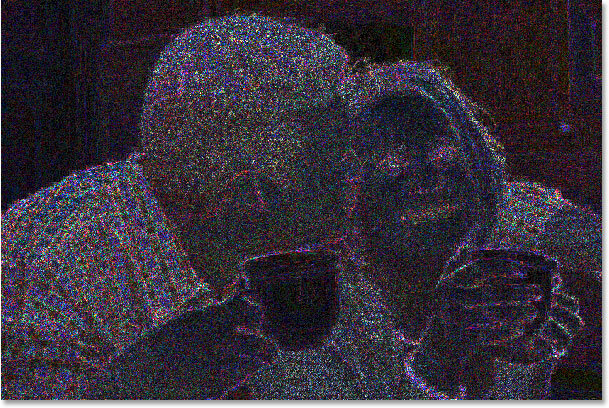 The image is now filled with what are commonly referred to as "compression artifacts", which is just a fancy way of saying "we took your perfectly good image information and messed it all up". Compressing a jpeg image can greatly reduce your file size, but as the Difference blend mode is showing us, it can also greatly reduce image quality. 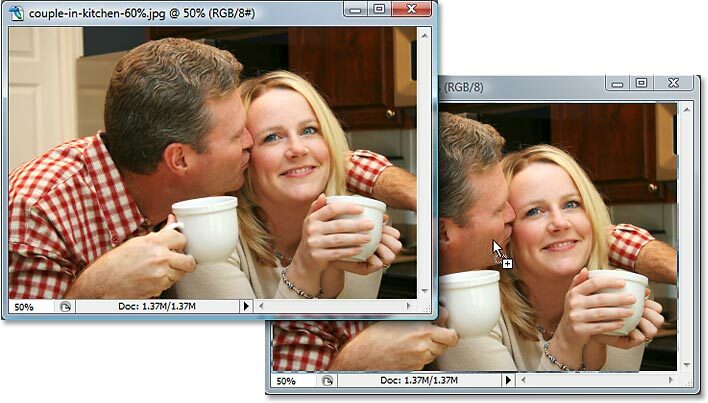 Again, it's not always easy to see how much damage your image has suffered by looking at it on your computer screen, but you'll definitely notice the difference when printing in high resolution. So now that we've seen how much damage we can do to a digital photo by compressing it, what can we do about it? Unfortunately, not much. The jpeg format is still your best bet for saving digital photos, and when file size is an issue, we really have no choice but to compress them. If you're working on a project for the web, you can usually get away with quite a bit of compression before image quality becomes an issue, but if your project is going to print, you'll want to use the original, uncompressed images whenever possible. And there we have it!